Imagine having your own car wash that you could visit any time you choose. That’s what it’s like when you join our Unlimited Monthly Wash Plan. Visit our car wash as often as you like (even every day) for one low monthly fee. Our Unlimited Monthly plan is the smart and convenient way to ensure that your car is always looking its best even during those messy winter months when snow, salt, and ice make keeping cars clean a constant battle. 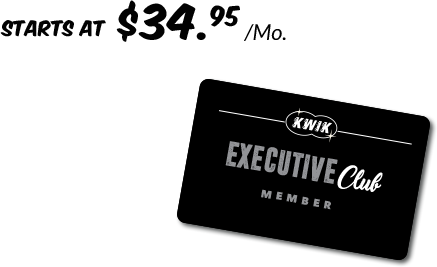 Joining our Unlimited Monthly Wash Plan is easy, just visit Jerry Kuhn’s Kwik Car Wash to complete the application. Your credit card will be automatically charged the same fee on your monthly anniversary date. Of course, you can drop out of the plan any time and your credit card will no longer be charged. Each monthly pass membership is good for only one vehicle. Tire Shine, Hot Wax & Fragrance. Tire Shine and Hot Wax. Let us help you keep your vehicle immaculate. Enjoy unlimited access to our top In/Out package; the In/Out Emerald. 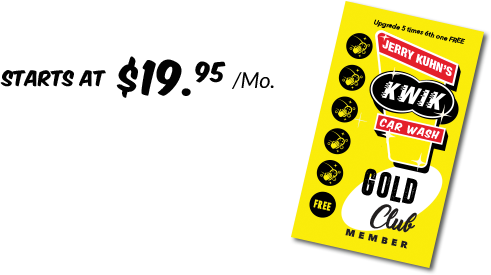 All Exterior Gold Club members can add In/Out service for $8 ($2 Off), and on their 10th visit, get upgraded for Free! (Must present card). All In/Out Executive Club members have a $20 credit toward Specials and Express Detail upgrades each time they visit.